One morning, I woke up extremely sick, my older children, seeing the problem, followed our chore schedule and homeschooling schedules. When I entered the real world later in the afternoon, I smelled supper cooking, the house was clean, and the children were finishing school. Keeping the house running efficiently can be a problem, especially if you are homeschooling. If every member of the family works together, following a plan, life can run a little smoother! At the same time, creating an atmosphere for great character building. To keep chores from seeming monotonous, come up with a colorful chore schedule that can be viewed at a glance to help them remember things that need to be done around the house!! Creates an atmosphere for great character building. The work gets done without mom doing it all. At a glance everyone can see what needs to be done. The work gets spread out among many people, making more time for other things...like FUN!! List every chore possible that needs to be done in the home. Take a piece of paper and divide it into fourths. Label them as daily, weekly, monthly, or 2x year. Going through each room, write down every chore you want done. Place those chores in each of your categories. 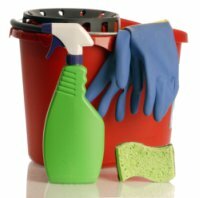 Download your free downloadable household chore check-list (below) and think about what days it makes sense to do which tasks. Now add the monthly chores, then the yearly...Make out a schedule for each member of my family, based on all the chores on the four lists. If you follow your chore checklist, your house should run much smoother, be more clean, and the whole family will be happier!! Believe me...with 11 people in out home from 10 months to 17...I would know!